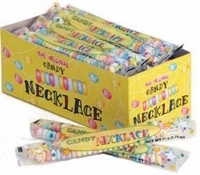 These Smarties candy necklaces are loved by kids of all ages and are found in many of our nostalgic candy and retro gift baskets. We also carry lipsticks and charm bracelets for a whole day of fun. These novelty treats make great party favors or just to sit an eat and remember when. Heck even little boys like these necklaces, although ask any guy and they will probably deny it, but I am sure they also ate these as a kid and will grin even while they are denying it.